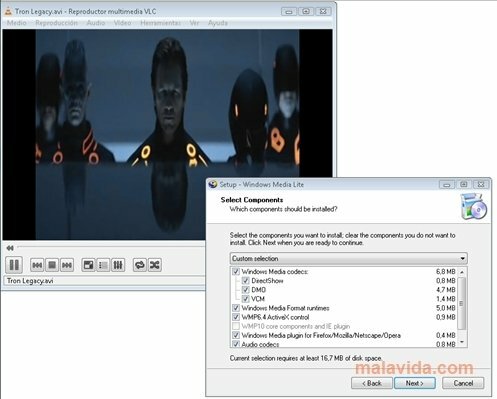 Windows Media Lite is the perfect solution for those users that need to play WMA (Windows Media Audio) or WMV (Windows Media Video), without having to resort to Windows Media Player. It is a collection of codecs that will install the necessary libraries and controllers to be able to play multimedia files stored on our PC with the players of our choice. 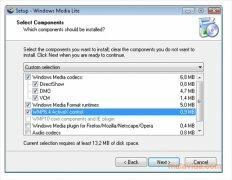 Once the installation has started, we'll have the opportunity to be able to select what components that we want to install, including the plugins for Firefox, Opera and Netscape, that will allow us to play online music and videos. This collection of codecs doesn't require any kind of configuration, something that is really good, because once they are installed, we'll only have to launch those files that we want to enjoy, without having to worry about anything else. 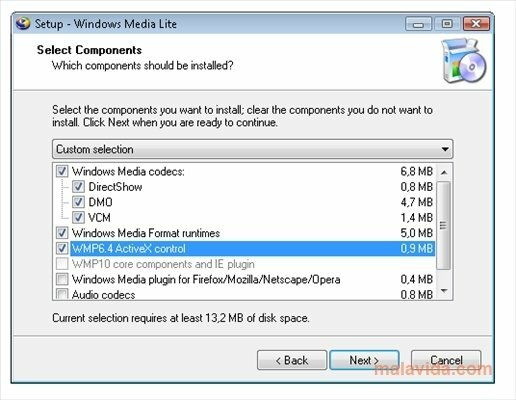 Download Windows Media Lite now and play WMA and WMV files with the program of your choice.